Notice: This post discusses women's menstruation and frustration. If that makes you uncomfortable, please take this as fair warning. Today was going like every other day, post-holiday. On top of trying to catch up on cleaning, caring for the baby, and feeding everyone lunch, I had to make sure we were out of the door by 2 pm to get the kids to their music lessons. In my bustle to get us out the door on time, one of the kids mentioned that they'd heard someone knocking on the door. It wasn't until a few minutes later, baby in arms, that I opened the door and saw an unfamiliar work truck in our driveway with two men at work on our septic tank. We weren't expecting anyone doing work, so I went out onto the porch in the freezing cold to say hello and ask what they were doing. Today, for us in Maryland, it's a chilly 38º F. They're forecasting snow for tomorrow. Wouldn't that be great? It's been awhile since we've had snow at this time of year. My kids would be thrilled. However, for those of you who live in warmer climates, this recipe for Cranberry Apple Ice is perfect for some refreshing festive cheer! I know that Christmas time usually goes hand in hand with roaring fires, sledding, and snowmen, but let's face it - the warmer climates associated with Christmas largely get ignored, because it's not the charming wintery Currier & Ives portrait we imagine with the season. So, you tropical/desert lovelies, this recipe is for you! 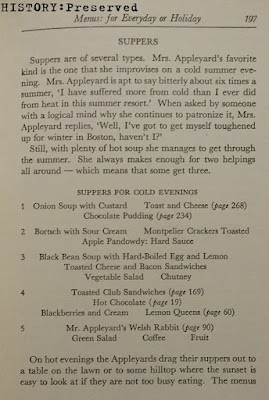 This week's post is for these cold evening supper menus from the very amusing Mrs. Appleyard's Kitchen published in 1942. 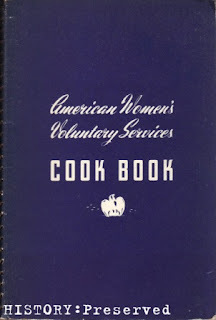 It's hard to say this is a cookbook, even though there are recipes and an index at the back. 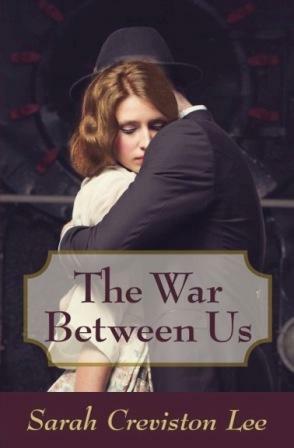 It's more a fictional story about a woman called Mrs. Appleyard and all about her cooking skills, or lack thereof, with recipes sprinkled throughout. There's a lot of tongue in cheek humor and poking fun at the poor woman. 😁 Even though the page I include talks about cold summer evenings, the ideas translate very well no matter what the season! I included a funny passage from the end of the book for your enjoyment. Happy December, and here's to colder weather! This week's post is for Sweet Potato Souffle! 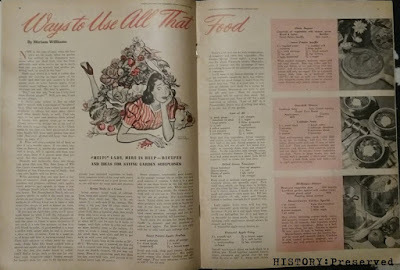 It's from an fun article from the October 1943 issue of Farm Journal and Farmer's Wife magazine called "Ways to Use All That Food". This article makes reference to using the bounty of the autumn harvest. I could also apply to using up Thanksgiving leftovers. Using up Thanksgiving leftovers has probably been a thing since the beginning, and it will probably continue into the future! 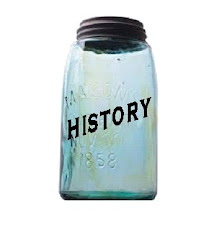 It's fun to see 1940s solutions. NaNoWriMo is in full swing. Right now my word count stands at almost 17,000 words. Wow! 50,000 words seems so far away, but if I just keep plugging along, I'll get there eventually! 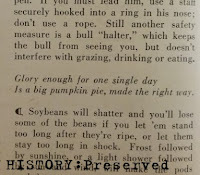 For this week's post in the series, I chose this neat article in the October 1942 issue of Farm Journal and Farmer's Wife called "Time and Sugar Savers." The article emphasizes the time and sugar saving benefits of "semi-prepared puddings, gelatins, rennet custards, ice cream and cake mixes." Puddings, flavored gelatins, and cake mixes came with sugar already in the mix, just like it does today, saving on the family's sugar ration. I think from this article we can begin to see the reliance on packaged, semi-prepared products in our culture. 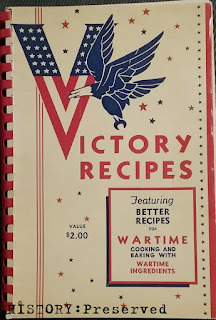 They'd been in existence before the war, but besides them being super convenient, the fact that they saved on sugar in wartime was, I'm sure, an extra boost in its popularity. 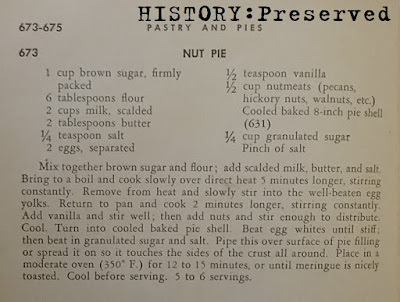 This weeks' Autumn Wartime recipe is for the very promising-sounding Sweet Potato Pecan Pie! With Halloween behind us and Thanksgiving ahead, this recipe looks like just the ticket to get into the holiday spirit! Update 11/10/17: I couldn't resist trying this pie in advance of the holidays. It was too good to pass up for later! And, boy was it delicious! 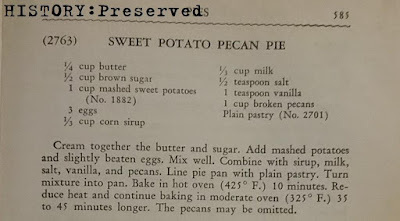 My entire family detests sweet potato, but they gobbled this pie up. 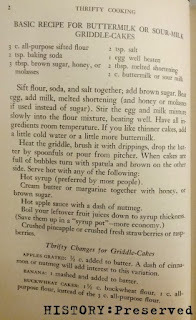 That is a true testament to this recipe's excellence! (It also helped that we served it with a scoop of vanilla ice cream. Mmmm....) I think next time I'll decrease the salt to 1/4 tsp. and instead of corn syrup, I'll use maple syrup. I was worried about it not having cinnamon or nutmeg, but I didn't notice the absence really. I might add a wee bit next time. Maybe a 1/4 tsp. of cinnamon. Oh, man I can't wait to make this again. You will have to give this one a try, my friends!